Home / Stock Picks / Hot Stocks / Is Campbell Soup Stock a Buy on Takeover Potential? Is Campbell Soup Stock a Buy on Takeover Potential? Monday was a brutal day for the stock market. The S&P 500, Dow Jones Industrial Average and Nasdaq Composite fell about 2% on the day. While most stocks fell on the day, Campbell Soup Company (NYSE:CPB) wasn’t one of them … instead, CPB stock climbed almost 10% on the day. Why such a stellar outperformance? Over the weekend, there were reports that Kraft Heinz (NASDAQ:KHC) is interested in acquiring the company. The New York Post reported that the sales process could begin soon, as Kraft is apparently very interested in CPB stock. If CPB is for sale, the report also says General Mills (NYSE:GIS) could be an interested buyer as well. After Monday’s rally, Campbell Soup sports a $13.1 billion market cap. That’s almost half of General Mills’ $27.4 billion market cap and much smaller than Kraft’s $78 billion market cap. Reports of a possible KHC-CPB tie-up began about a month ago, as Campbell CEO Denise Morrison stepped down. The decline in the CPB stock price has likely made it more intriguing to buyers as well. Shares are off their 52-week high by more than 20% and just to get to that point, it has taken a huge rally over the past few sessions. Just a few weeks ago, it was almost 40% off its 52-week high. Still, it hasn’t been a short-term decline, as CPB stock is more than 30% off its highs made in January 2017. Given that slow-but-steady fall, interested buyers have had a lot of time to comb over CPB stock. So Should You Buy Campbell? Last year, Campbell was turning to its own M&A strategy, acquiring Pacific Foods for $700 million in May and pretzel maker Snyder-Lance for just over $6 billion. Aside from its soup division, the company now boasts brands like Pepperidge Farm, V8, Prego, Swanson, Pace salsa, Goldfish and Bolthouse Farms. Campbell has done a good job transforming from a pantry-based soup company to one with more fresh offerings (like Bolthouse) and more snacks (like Snyder’s pretzels and goldfish). However, it’s still clearly struggling in the grocery store and these new bolt-on acquisitions and growth avenues haven’t been enough. Let’s put it this way: Analysts expect sales to increase more than 10% in 2018. However, they expect a 5.6% decline in earnings-per-share. 2019 looks similar, with revenue estimates calling for an 18% hike and again, a 2.5% decline in earnings. How can Campbell go from $7.89 billion in sales to $10.3 billion in two years and see its bottom line shrink? Also note that last quarter CPB had 15% revenue growth. Of that though, 14 points came from acquisitions (Snyder’s and Pacific) and the other 1 point of revenue growth came from currency gains. It’s legacy business is doing nothing and in this regard, it reminds me of something like International Business Machines (NYSE:IBM). No growth from its legacy business and while emerging segments look promising, they’re not doing enough to turn the ship around. I love owning a company that has takeover potential, but I have to like the fundamentals first. Without liking CPB stock as a standalone, potential M&A isn’t enough to get me on board. That rumor could fizzle tomorrow and suddenly we have a 10% loss overnight. CPB stock trades at about 15 times this year’s earnings and pays out a 3.3% dividend yield. But I don’t like the decline in earnings. Margins have been under pressure too, falling a whopping 680 basis points year-over-year last quarter from 35.9% to 29.1%. Even excluding certain items, they still fell 300 basis points. That type of erosion is unattractive. So too is the debt. Because debt was used to finance the Snyder’s deal, total debt went from about $3.5 billion last year to almost $10 billion last quarter. While Apple (NASDAQ:AAPL) could pay that sum off in its sleep, keep in mind that CPB stock barely has a $13 billion market cap. It’s just not attractive to me on a fundamental basis. If I’m going with a consumer packaged goods stock, it’s going to be a PepsiCo (NYSE:PEP), a stock we flagged for InvestorPlace readers some 13% lower than today’s prices about a month ago. That said, CPB stock has been trading somewhat technically as of late. You can also see why the $42.50 to $44 level could act as resistance in the short-term. 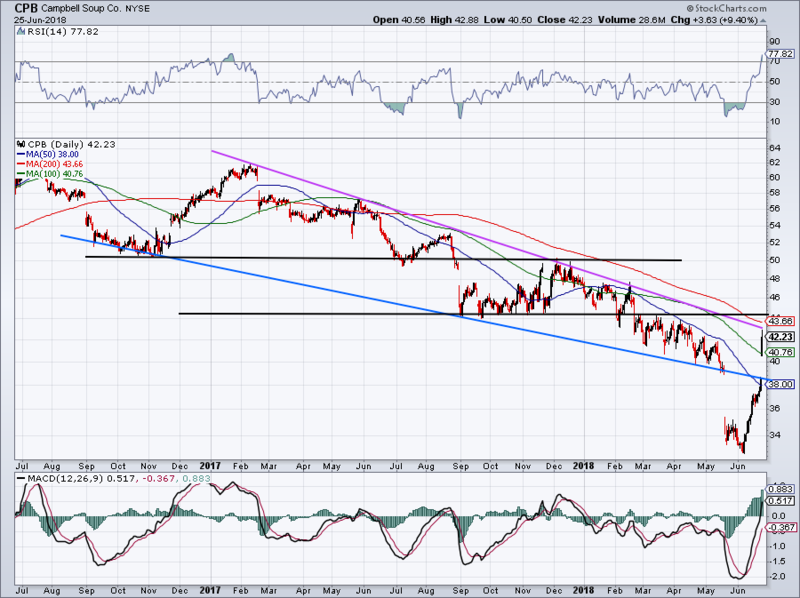 If CPB stock clears this level, it could act as support and a move to $50 becomes possible. Should shares pullback, look for CPB stock to find support near $38. Bret Kenwell is the manager and author of Future Blue Chips and is on Twitter @BretKenwell. As of this writing, he was long AAPL. Article printed from InvestorPlace Media, https://investorplace.com/2018/06/is-campbell-soup-stock-a-buy-on-takeover-potential/.